Discover precision performance on a 34" curved monitor that elevates your work, gaming and entertainment. Take your work projects and home entertainment to the next level with an amazing display, stunning details, and high-quality performance. 3440 x 1440 Ultra HD maximum resolution for a superior level of picture detail and a clear, bold display. 178-degree horizontal viewing angle that lets you share presentations or collaborate with a co-worker. 1000:1 typical contrast ratio enables accurate color reproduction. 5ms (black to white) typical response time allows pixels to change colors quickly, so you can enjoy smooth videos. Compatible with both legacy and future-ready PCs via VGA and HDMI connectivity. diagonal screen size 34 in. in. Immerse yourself in the curve: Increased screen curvature enhances your field of vision by delivering near-uniform focus, so you can immerse yourself in work or play. High performance perfected: WQHD 3440x1440 resolution offers stunning clarity while the flicker-free screen with ComfortView optimizes eye comfort. Multitasking made simple: Work from two PCs simultaneously on one screen. Arrange your screen using layout apps in Dell Easy Arrange and both picture-in-picture and picture-by-picture features. Lose yourself in all-encompassing views. Take your work projects and your home entertainment to the highest level with an amazing display, stunning details, and high-quality performance. Sensational screening: Increased screen curvature improves your field of view by reducing reflection and creating near-uniform visual focus. This reduces your eye movement across the screen, so you can work comfortably for longer. Go deeper into the action: Experience unmatched gaming immersion. The extended peripheral vision on this monitor creates the sensations of incredible depth, breadth and a wrap-around view. Endlessly entertaining: A curved screen creates a panoramic cinematic experience that instantly elevates an evening of video streaming. Incredible performance whether you’re on the job or in the game. Feast your eyes on this: With WQHD 3440 x 1440 resolution, consistently accurate color and a wide viewing angle, you’ll get clear, sharp views every time. Programmed for perfection: We carefully calibrate the color on the 34" monitor so you get 99% sRGB straight out of the box. Get comfortable: Experience optimal eye comfort with a flicker-free screen and ComfortView, which reduces blue light emissions. A sensory experience: Enjoy enhanced audio and impressive visuals on a huge 34" monitor with an ultrawide 21 : 9 aspect ratio and powerful dual 9W speakers for high-level sound. Take advantage of the 34" monitor’s many productivity features. Customize your layout: View multiple applications at a glance in one window with Dell Easy Arrange. Select your layout, then drag and drop apps into your preferred location. Manage multiple tasks: Picture-in-picture and picture-by-picture features make it easy to work on many projects and activities simultaneously. Work efficiently: Display and edit content from two PCs on your screen at once, using a single keyboard and mouse. 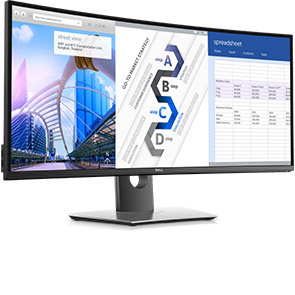 Dell UltraSharp U3417W - LED monitor - curved - 34"